Ontario's finance minister blasted the Progressive Conservatives for playing "gutter politics" Tuesday, after the Tories claimed to have obtained internal documents showing the Liberal government's leaked budget details a month in advance. The PCs also say they have documents outlining a series of funding announcements the Liberals plan to make leading up to the budget's release, which the Tories say was scheduled for a May 1 announcement. "They are playing gimmicks. They are out there doing the worst form of gutter politics. 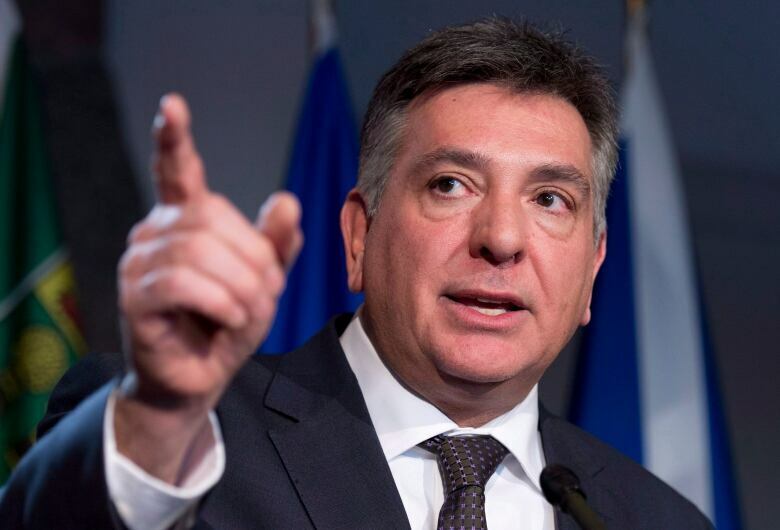 I am not going to stand for that​," finance minister Charles Sousa told reporters at Queen's Park, when asked about the supposed leak. PC leader Tim Hudak said there is a "secret" Budget Leaking Team, or BLT, in place to strategically leak portions of the budget. He questioned the premier on the supposed team. "There is always a plan to foreshadow the budget," Premier Kathleen Wynne said in response. Hudak said there is an 11-page "Pre-Doc Communications Rollout plan" for 39 announcements over the next month that will add up to about $5.7 billion in new spending. "Are we preparing a budget? Absolutely. Are the ministry of finance officials involved? Absolutely. Do we have a communications plan? Yes we do," Wynne said at Queen's Park. Hudak continually questioned Wynne about the so-called budget leaking team and whether bureaucrats were brought in to staff it. "We did hear from whistleblowers within the civil service who are very concerned that you are now drafting Ontario civil servants to do the work of the Liberal party," he said during question period. Wynne again responded that the government was working on its budget rollout, as the province expects it to. Hudak asked how the Liberals would find the funds to make 39 spending announcements totalling $5.7 billion in the next 21 days if the leak the Tories say they obtained is true. Sousa said the government would release a "forward-thinking plan" in time, "one that includes a rollout by our comms team that I'm very proud of." Speaking to reporters after question period, Sousa accused the Tories of trying to distract from an economic plan that he says will help jolt the economy and create jobs. "The opposition may want to deflect or push us around," he said. "[The Tories] realized that there is a tremendous amount of initiatives that are part of the plan for the benefit of Ontarians. They don't want that story to be told. That story will be told in due course," he added. Asked to comment on Hudak's assertion that the Liberals have politicized the civil service, Sousa said the government was simply working together with ministry staff to put forward a responsible budget.